I’m always on the lookout for totally unique and somewhat out-of-this-world wedding cakes. Why? Because sometimes that “traditional” wedding cake just won’t do it. Which is why I’m head over heels for today’s cake. I present to you the “West End” cake from our friends at Hockleys Cakes over in the United Kingdom. This stunning creation has so much going on, but it’s not overwhelming in any way. In fact, it all just works. 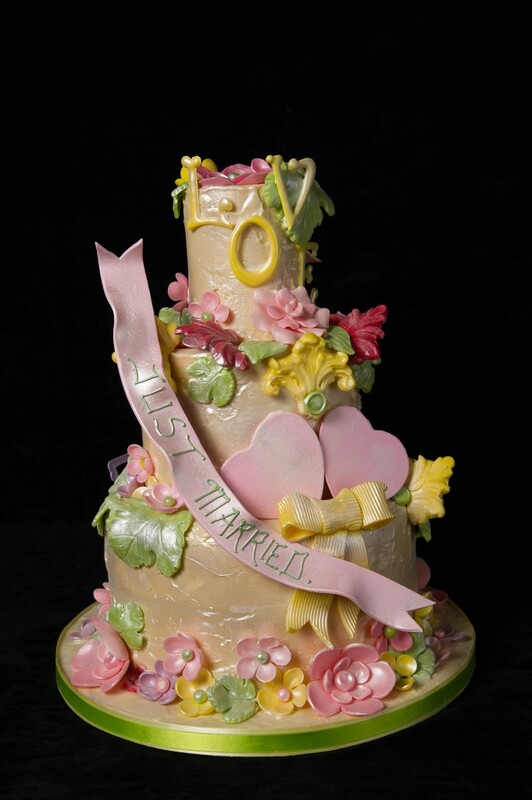 The artists at Hockleys uses a combination of sugar and chocolate work to give the cake it’s unique look with flowers, hearts, leaves, a “Just Married” banner, and the word “love” spelled out at the top of the cake. Any of those embellishment on their own would have been lovely, but mixed together as they are? Total perfection and the pastel color palette is so pretty. 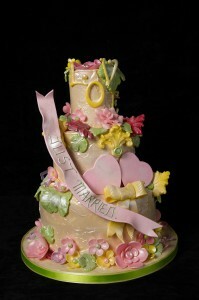 Can’t you just imagine this cake at a spring wedding? Thanks again to Hockleys for sharing this cake with us.